I’m reading David Graeber’s…I’m not sure what to call it? His polemic? His history? His anthropological study? Anyway, it’s a book about debt. And it’s also about money. And economics. And our conceptions of ethics and citizenship. But that makes it sound a lot more far-reaching and disperse than it really is. Actually, what’s odd about the book is how focused it is. 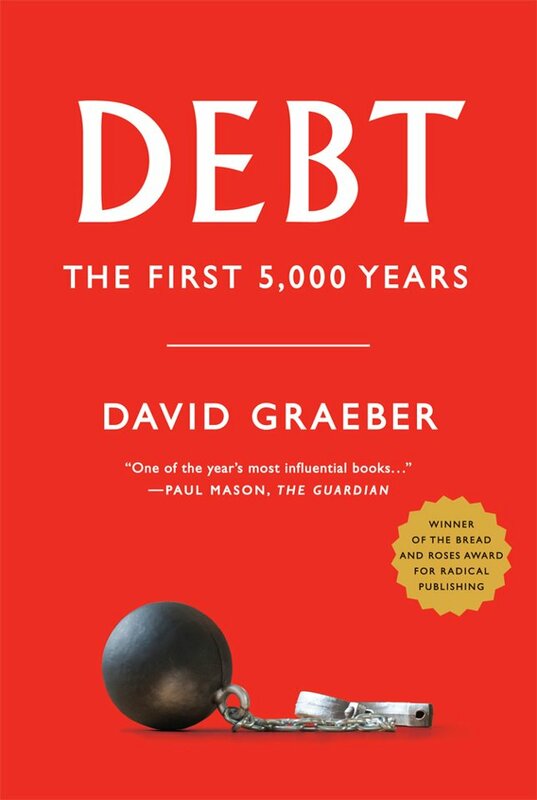 To a large extent, the book really is about different conceptions debt and money and the history of those concepts. Lots of it is focused on the differences between how anthropologists understand human behavior and how economists understand human behavior. And it is legitimately thought-provoking. For instance, the first hundred pages or so of the book are dedicated to attacking what he calls “The Myth of Barter,” which is the idea that prior to the development of currency, people bartered for goods with each other by swapping, like, a goat for a pair of shoes. He says that’s a story that economists promulgated because it seemed to make sense to them. They knew that there had been a time before money, and they felt like they needed to understand how commerce possibly could’ve worked without money. But Graeber says that this barter economy strikes any anthropologist as obviously nonsensical, since no such society has ever existed. Like, on the most basic level, what usually happens if you’re in a small community and you live near someone and they need something that you have is that you go and give it to them. And then, later on, they give you something that you need. The idea here is that debt predates the availability of currency. Not that far into it, so the thing hasn’t coalesced yet. Basically, I haven’t yet gotten to the “So what?” part. Like, yeah, I buy it. Debt is a powerful thing, and it occupies a strange moral space in our society (for instance, he makes the point that we simultaneously hold the belief that there is a moral obligation to pay your debts, and that people who loan money out for interest are evil). But I’m still not quite understanding what all this should mean to me? I suppose my reading of the book is colored by the fact that I know Graeber was involved in the Occupy movement, so I keep expecting a radical political element to intrude. I’m pretty certain that it will, but I haven’t quite gotten there yet.